Downtown Creston is a typical regional Iowa town with a big train station and tall buildings like the newly renovated Hotel Iowana. 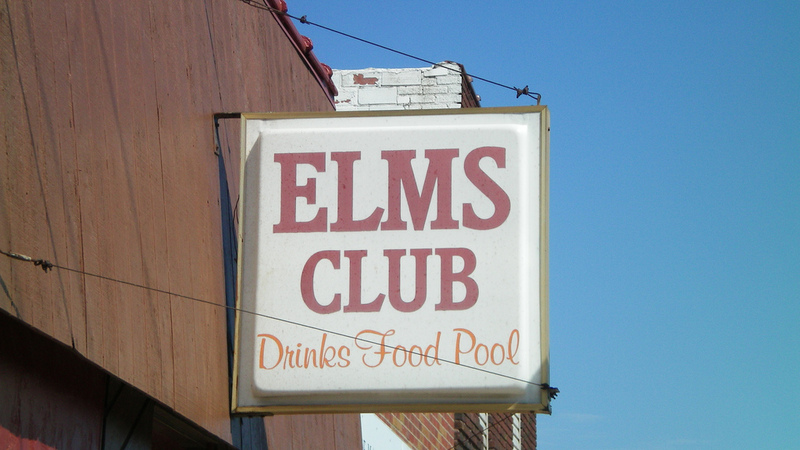 The exterior of The Elms Club gives no hint that any kind of special sandwich lies inside. 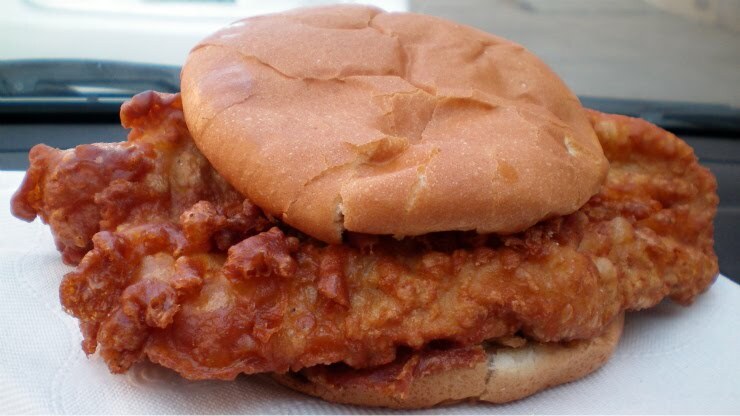 Walking inside and looking at the menu reminds the visitor that this was a 3rd place winner in a 2003 IPPA Breaded Tenderloin contest. I had been meaning to make it here earlier. A few years ago I came to this place on a Friday night only to find it was a bike night and the kitchen was closed with a bbq smoker selling pulled pork sandwiches outside. Location: 108 North Elm Street Creston, Union County, south and west of Des Moines. Directions: The Elms Club is on Elm St in the old downtown area of Creston, north of the railroad tracks and Amtrack Station. Follow the signs from the highway to find the business district. Online at: A facebook page is HERE. 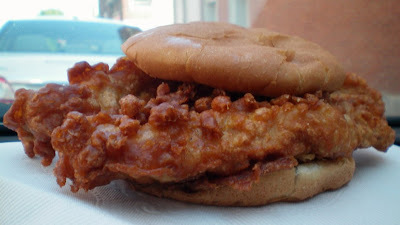 The Tenderloin: The thick and slightly seasoned batter made several crunchy knots on several edges of the tenderloin. Delicious looking golden brown outside lead to bright white pork inside. 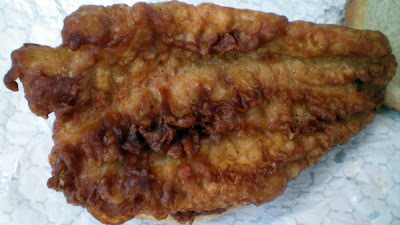 The whole sandwich felt heavy, but not too big for small appetites. The juiciness and thick white meat was tasty and just tender enough. This is a good one. Overall 9.0 out of ten. Price: $4.25, an exceptional value. 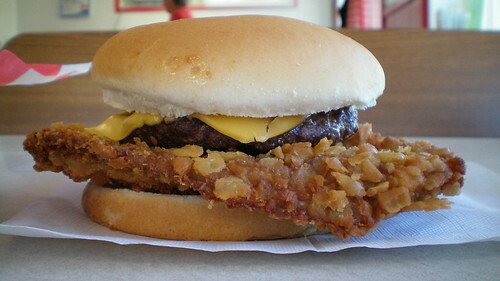 Also on the menu: the usual bar food and fried stuff with burgers and chicken fried steak. Service: Its bar service and the place gets busy for Karaoke and other events. Ambiance: This is a darkly lit bar with tables, booths, and a counter for seating. The light comes from beer signs and flatscreen televisions. Taking pictures inside the bar were impossible, and most of my photos didn't get the color quite right. 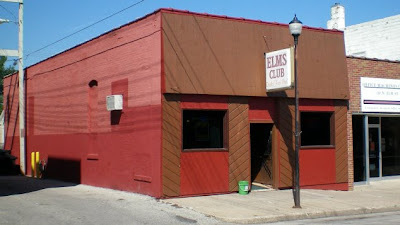 Final Thoughts: The Elms Club in Creston is a low key small town bar with a very good battered tenderloin. Its as the sign reads: Drinks, Food, Pool.